Tic Tac Trance #030 Replay available! Almost exact 2 years ago I launched the first “From The Beach To The Club” special edition of Tic Tac Trance. 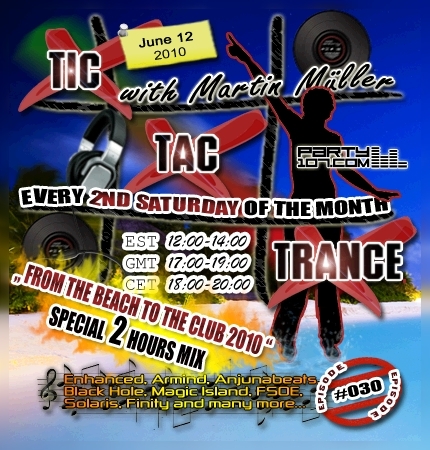 After many requests, Party107.com will broadcast this year’s “From The Beach To The Club 2010” episode of Tic Tac Trance on June 12, 2010! You can expect a melodic slow alluded start of my radioshow, which will develop more and more into a clubby atmosphere. This time tunes of following labels are featured: Enhanced, Armind, Anjunabeats, Black Hole, Magic Island, FSOE, Solaris, Finity and many, many more! My show will air on June 12 at 18 CET / 17 GMT / 12 EST. Check out your local time HERE!